AWST Intl: Hand Bags, Fringe Purse, Totes, Hobo Style Bag | Wildkin Messsenger Bag! 14"W x 8"H x 4.5"D. Great gift idea! ORDER NOW! 9 H x 8 W x 3 ¼ D inches. Great gift idea! ORDER NOW! 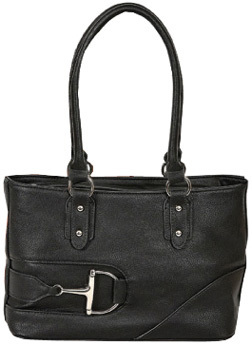 Lila Hobo Bag: Buttery soft, textured faux leather hobo style bag, debossed with "Lila" horses. Fully lined, double nzippered compartment with interior zip pocket and 2 slip accessory pockets. Back zippered pocket and open slip pockets on each end. 15" W x 8-10" H x 5" D. Great gift idea! BUY NOW! 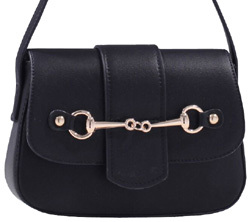 "Lila" Debossed Horse Head Cross Body Purse: "Lila" Cross Body Purse is a faux leather bag presenting abundantly of Western style! 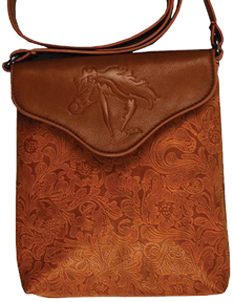 Cross Body Purse has tooled look body with embossed "Lila" horse head design on top flap closure. Magnetic strap adjusts from 40" to 45" for shoulder or cross body wear. 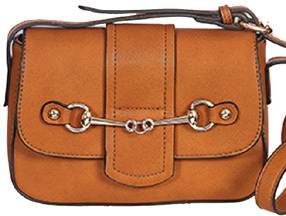 Cross Body Purse is fully lined with inside zip. • "Lila" Debossed Horse Head Cross Body Purse TAN #LP420TN: Provides the flexibility of wearing it as a shoulder purse, or across the body. Measures 7 3/4 x 8 3/4 inches. Great gift idea! BUY NOW! 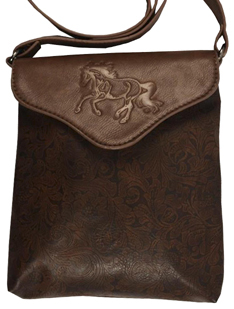 • "Lila" Debossed Horse Head Cross Body Purse BROWN #LP420BR: Provides the flexibility of wearing it as a shoulder purse, or across the body. Measures 7 3/4 x 8 3/4 inches. Great gift idea! BUY NOW! 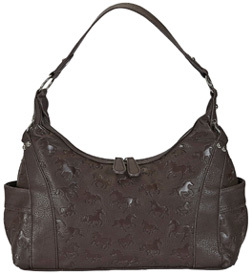 Lila Cross Body Bag: Super compact, cross body bag in textured faux leather decorated with "Lila" horses. Fully lined, zippered main compartment with interior zip pocket and 1 slip accessory pocket. Front & rear zip pockets. Shoulder strap adjusts from 29-54 inches. Measures 7.5 W x 8.5 H x 2.5 D. BUY NOW! 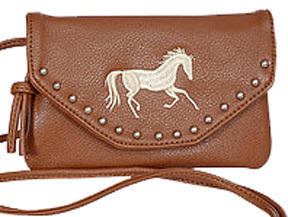 Cross Body Purse: Faux leather with silver-tone studs and embroidered galloping horse. Snap closure and 3 inside pockets, one with a zipper. Doubles as a wallet or purse. Adjustable 72 inches strap is long enough to wear "cross-body" or can wrap around the waist. • Cross Body Purse w/Studs TAN & IVORY #LP410TN: Tan faux leather with silver-tone studs and embroidered Ivory galloping horse. Measures 7 W x 4 1⁄2 H inches. BUY NOW! • Cross Body Purse w/Studs LIGHT BROWN & IVORY #LP410LBR: Light Brown faux leather with silver-tone studs and embroidered Ivory galloping horse. Measures 7 W x 4 1⁄2 H inches. BUY NOW! 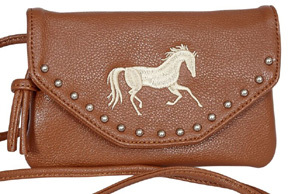 • Cross Body Purse w/Studs CHOCOLATE BROWN #LP410BR: Chocolate Brown faux leather with silver-tone studs and embroidered Ivory galloping horse. Measures 7 W x 4 1⁄2 H inches. BUY NOW! 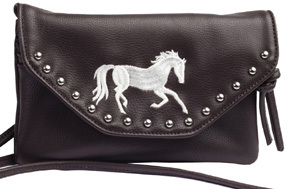 Belt Loop/Cross Body Purse: Faux Leather with silver-tone Studs and embroidered "Lila" Galloping Horse. Fold over snap closure pocket in the front and one zippered compartment on top. 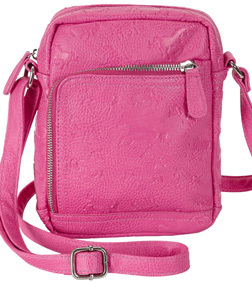 Comes with adjustable strap long enough to wear “Cross-Body”. 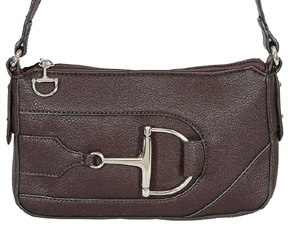 • Snaffle Bit Cross Body Purse BROWN #LP805BR: Brown cross body purse with snaffle bit accent. 8.5" x 6.5"x 2.5". BUY NOW! 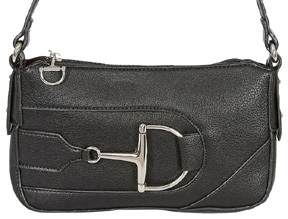 • Snaffle Bit Cross Body Purse BLACK #LP805BK: Black cross body purse with snaffle bit accent. 8.5" x 6.5"x 2.5". BUY NOW! 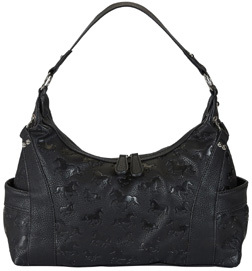 Snaffle Bit Shoulder Bag: Faux leather with silver-tone studs and embroidered galloping horse. Snap closure and 3 inside pockets, one with a zipper. Doubles as a wallet or purse. Adjustable 72 inches strap is long enough to wear "cross-body" or can wrap around the waist. • Snaffle Bit Shoulder Bag BLACK #LP430BK: Tan faux leather with silver-tone studs and embroidered Ivory galloping horse. Measures 7 W x 4 1⁄2 H inches. BUY NOW! 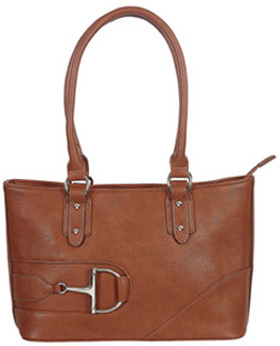 • Snaffle Bit Shoulder Bag BROWN #LP430BR: Black Faux Leather Snaffle Bit Shoulder Bag. Measures 7 W x 4 1⁄2 H inches. BUY NOW! Snaffle Bit Wallet:Snaffle Bit Wallet with credit card slots, cash compartments and check book holder. Zip pocket on back, snap closure. 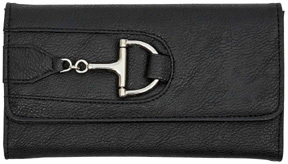 • Snaffle Bit Wallet BLACK #LW300BK: Measures 7 ½ W x 4 ½ H inches. BUY NOW! 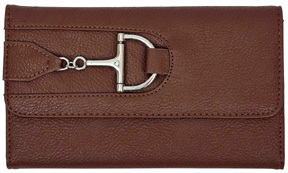 • Snaffle Bit Wallet BROWN #LW300BR: Measures 7 ½ W x 4 ½ H inches. BUY NOW! 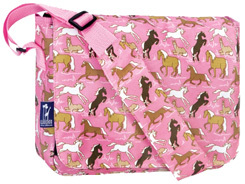 • Jumpstart Messenger Bag Horses in Pink: Get the jump on your day with Wildkin's Jumpstart Messenger Bag. Cool and convenient, this messenger bag will easily hold your 15 inch laptop, tablet, or books. It's great for school, travel, afternoons at the coffee shop, or for around town. 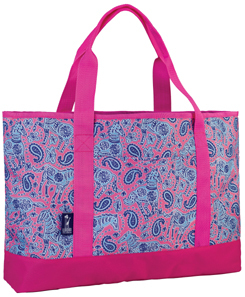 Features include multiple interior pockets and a water-resistant lining. 2 Exterior front pockets and 2 utility pockets for phones, pens or paperbacks. 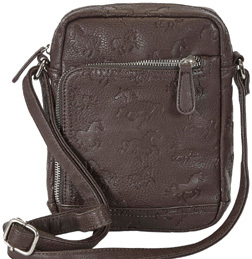 Plus, have two buckle straps plus Velcro-like closure for added security. Adjustable padded shoulder strap. This bag has what you need to keep you organized when on the go. Measures 10 in. x 15 in. x 5 in. A bestselling Wildkin Classic. Ages 8+. Great gift idea! BUY NOW! 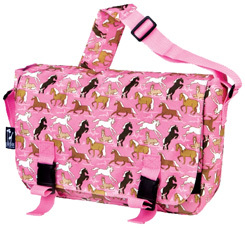 • Kickstart Messenger Bag Horses in Pink: Kick your day into high-gear with one of our Kickstart Messenger Bags. This multi-functional bag is durably constructed with lots of storage space and extra pockets. Designed with 2 Exterior front pockets and 2 utility pockets for phones, pens or paperbacks. 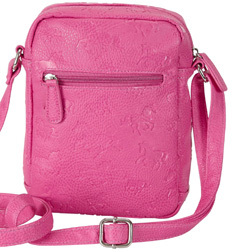 Velcro-like closure and adjustable padded shoulder strap. Great for school, afternoons at the coffee shop, weekend daytrips, and school. Measures 10in. x 13in. x 4 in. A bestselling Wildkin Classic. Ages 8+. Great gift idea! BUY NOW! Horses in Pink features a group of whimsically wild horses that prance, dance, jump, and just chill; their brilliant white manes and tails absolutely shine atop the pattern's lovely, timeless pink backdrop. "Lila" Camo Tote Bag: Lila Camo Tote Bag with zippered main compartment and interior accessory pocket. Side mesh pockets with draw cords. Shoulder straps 24" long. Great gift idea! ORDER NOW! 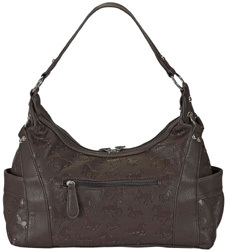 • "Lila" Camo Tote Bag GREY BLUE #GG789GR: Measures 19 W x 14 H inches. ORDER NOW! 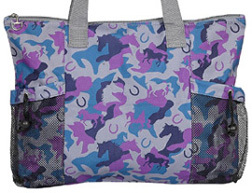 • "Lila" Camo Tote Bag PINK PURPLE #GG789PK: Measures 19 W x 14 H inches. ORDER NOW! • Jumper Tote EVENT #GG844:600 denier polyester with front zip deep pocket and zipper main compartment. 24“ handles. 18” wide at top. Measures 16 W x 15 H x 5 D inches. Great gift idea! ORDER NOW! 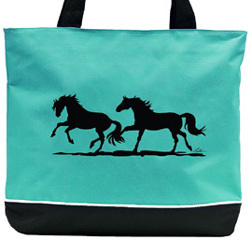 • Pair of Horses Tote TEAL #GG708TE: 600 denier polyester tote. Zippered main compartment with gusset top design. 28” shoulder straps. Measures 18 W x 15 H x 5.5 D inches. Great gift idea! ORDER NOW! 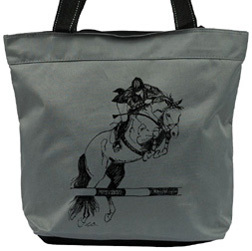 • "Lila" Galloping Horse Convenience Tote BLACK #GG950: Black Convenience Tote with "Lila" galloping horse. 600 denier polyester, with large zippered main compartment and two outer mesh pockets. Measures 19 x 14 x 2 inches. Great gift idea! ORDER NOW! 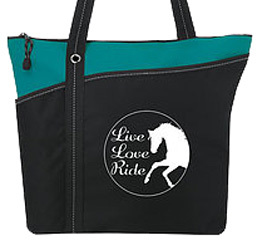 • Tote Bag "Live, Love, Ride" #GG665: 600D Polyester Tote Bag features a Zippered main compartment with One small and one large front slip pockets. Grommet and stitching accents and Shoulder-length handles. Measures 17" x 14.5". Great gift idea! ORDER NOW! 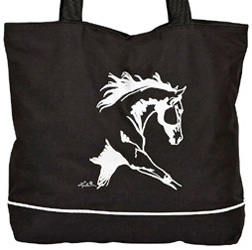 Lila Galloping Horse Tote: Large Tote Bag made of 600D Polyester. Zippered main compartment, front pocket, and two mesh side pockets. 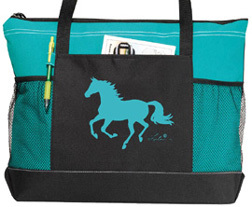 • Lila Galloping Horse Tote TURQUOISE #GG822TQ: Measures 20 L x 14 H x 4 W inches. Great gift idea! ORDER NOW! 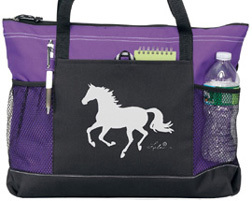 • Lila Galloping Horse Tote PURPLE #GG822PU: Measures 20 L x 14 H x 4 W inches. Great gift idea! ORDER NOW! 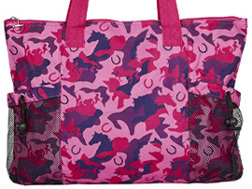 • Lila Galloping Horse Tote PINK #GG822PK: Measures 20 L x 14 H x 4 W inches. Great gift idea! ORDER NOW! 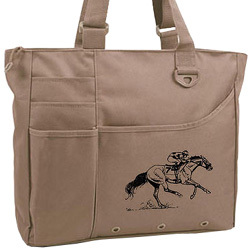 • Lila Race Horse Tote KHAKI #GG825: Khaki 600 denier polyester. Multiple pockets and interior zipper pocket. Straps are adjustable. Measures 15W x 13 x 4 inches. Great gift idea! ORDER NOW! 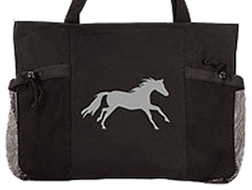 • Lila Dressage Horse Tote BLACK #GG771BK: Black 600 denier polyester. 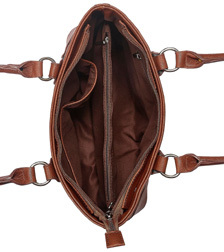 Zippered main compartment with gusset top design. 28" Shoulder Straps. Measures 18 x 15 H x 5.5 D inches. Great gift idea! BUY NOW! 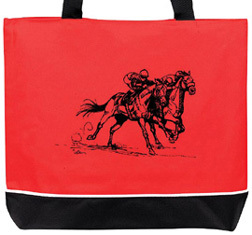 • Lila Race Horse Tote RED & BLACK #GG824: Red 600 denier polyester. Zippered main compartment with gusset top design. 28" Shoulder Straps. Measures 18 x 15 H x 5.5 D inches. Great gift idea! BUY NOW! 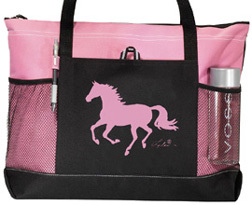 • Tote-All Tote Bags Watercolor Ponies Pink: Our Tote-All Tote Bags are made of super-durable, rugged, water-resistant 600 denier polyester, and are great for trips to the beach, the pool or friends' houses. Lined with water resistant layer. Easy to clean. The perfect anytime bag! measures 13.5 in.x 19 in.x 5.5 in. In this imaginative horse pattern, our watercolor ponies are galloping, prancing and walking amongst paisleys and flowers. Ages 8+. Great gift idea! BUY NOW!